I got to Jack Coffey Field late. I knew it was going to be close, getting to the Bronx for the 1:00 PM start. My son was marching in the band for the parade that morning, and nothing was going to keep me from going to that event, completed under a perfect sky and perfect weather shining upon Main Street. Earlier in the week I made a calculation on whether I could make it to kickoff by leaving as soon as his marching gig was complete. If I left, right as it ended, and didn’t make any stops, and the traffic was just right, it was doable. So I decided it was a go. I’d be headed to the Bronx on a gorgeous Saturday that felt a lot more like September than November. Lehigh At Fordham Game Breakdown and Fearless Prediction: Will Edmonds and Anderson Play? 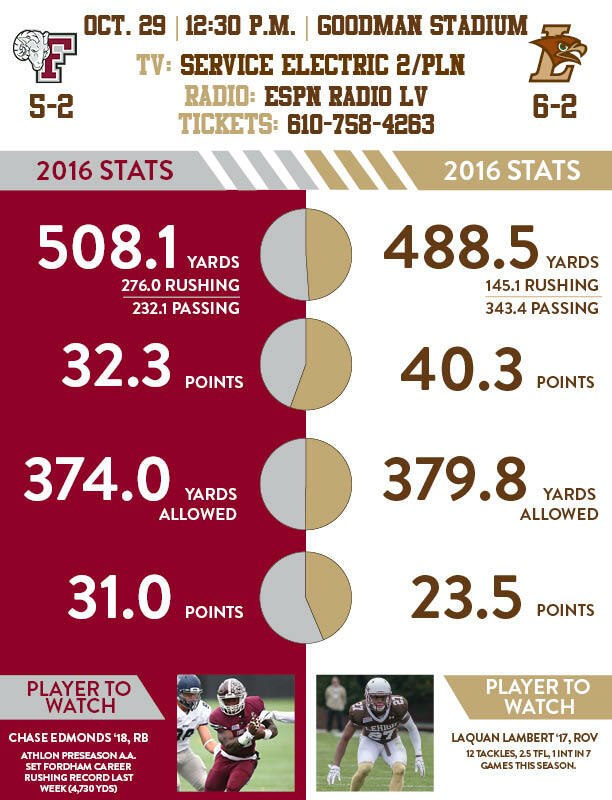 A key element to this week’s game is the status of Fordham QB Kevin Anderson and RB Chase Edmonds. It doesn’t take a rocket scientist to realize that Fordham is a different team with or without one or both of them. 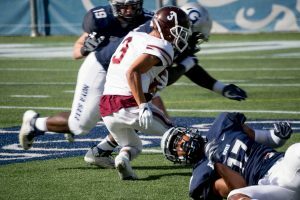 Edmonds was held out in the second half of a blowout loss to Colgate, only eight yards short of the Patriot League all-time rushing record, while Anderson left the Lafayette game with an ankle injury, and hasn’t returned since. Some speculation exists on the Fordham board that Anderson was suspended for the Georgetown game last week. If it is true that Anderson was suspended, and not hurt, the interesting part of that aspect is that there is historic precedent. If the official story is that Anderson was suspended for a “violation of team rules” – which, by a incredible coincidence, happened in two consecutive years in the exact weekend of the Georgetown game – it means two things. First, it means that Georgetown is the luckiest team in the Patriot League to miss Kevin Anderson twice. Second, it means that Kevin Anderson is starting on Saturday. I don’t know if Kevin Anderson and Chase Edmonds will absolutely start on Saturday. But I’m going to write this preview as if they are, because, frankly, I’m convinced they’re starting. Sometimes, things are exactly how they look. Back in March, looking at the schedule, plenty of Lehigh and Fordham fans looked at the schedule and circled October 28th, 2017 as a must-see game. WR Troy Pelletier? RB Chase Edmonds? Are you kidding me? It might be a battle of nationally-ranked teams! There’s an outside chance ESPN College Football Gameday might show up in New York City! Imagine that! College Football Gameday did indeed come to New York City this season. But it wasn’t for the matchup on October 28th, 2017. Now that the date is very close to being upon us, a very different College Football Gameday-free matchup awaits. Sure, WR Troy Pelletier will be suiting up for Lehigh, and even though he didn’t suit up versus Georgetown this week, it’s anticipated that RB Chase Edmonds will suit up this weekend as well. The game, without question, will be a showcase for some athletes that might very well find themselves playing on Sundays. For that reason, this could be a special game in the Bronx. But instead of a battle of Top 25 teams, it’s the 2-5 Mountain Hawks taking on the 2-6 Rams. And yet – there is some bullishness in the Bronx this weekend as well, for despite the disappointing records. 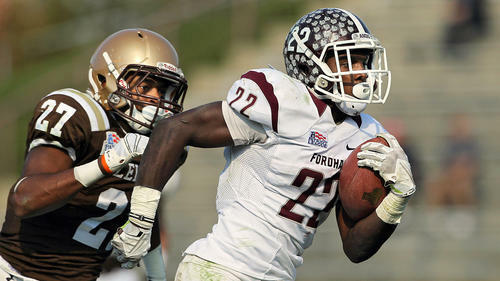 For Lehigh, at 2-0 in the Patriot League, and Fordham, at 1-2 in league play, a Patriot League Championship and an autobid to the FCS Playoffs still remain as a possibility for both teams. It’s perhaps not the matchup that folks expected back in the preseason – but for both talented offenses, there’s still everything to play for. Junior WR Troy Pelletier seems to want the game to start now. Like, yesterday. When you read and hear the interviews with him at media day this week, he seems to want the game to start right after the interview, to go on the field and get the game over with right now. Though he knows he and teammate junior WR Gatlin Casey are on top of the total receiving yardage list in FCS, that’s not what he wanted to talk about on Wednesday. There was lots of “focusing on getting better, taking it one game at a time” talk from both Pelletier and head coach Andy Coen this week, as you might expect. But their body language said something else: when will Saturday get here? “We missed the news cycle again,” a committee member said again. “Huh?” another said, awakening from a long afternoon nap. 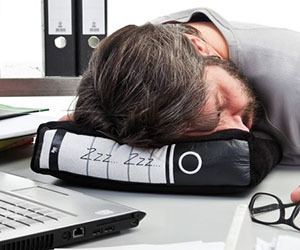 “Let’s get this done before we miss any more news cycles,” irritated guy responded.